Free Engraving on the handle! 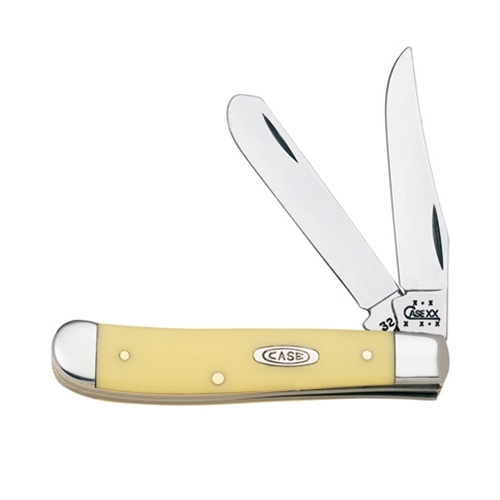 The Yellow Handle has been a favorite since the earliest days of Case, it's destined to be a favorite decades from now too. It's bright color helps you find it in the event that you drop it in the woods, or misplace it. 3 1/2" Closed, 2.2 oz. I purchased the Case Mini Trapper #3207 about 3 weeks ago. I've only used it to peel 2 apples, and the blade is so discolored it is partially black. I am so disappointed with this knive. Name to be Engraved on Handle - Please select a font. This Premium Engraving process darkens the engraving into the steel and changes the color of the engraving. The color and the engraving are permanent.